The makers of the British film Attack the Block realized something vitally important: If you’re going to make an outlandish movie, it’s best to move quickly. Clocking in at a fleet 88 minutes, Attack the Block might just be the sleeper hit of summer, an urban sci-fi movie that deftly walks the line between absurdity and realism. Credit the filmmakers for grounding a bizarre premise in something real. Hairy monsters with teeth that glow like blue neon attack a single South London block, mirroring the turf wars that can develop when people living in poor circumstances have little else over which to fight. Director Joe Cornish, a British comic making his feature debut, begins with a menacing but all-too-common bit of street violence. A gang of kids mugs a young woman (Jodie Whittaker) who’s on her way home from work. With this move, Cornish - working from his own script - sets himself up for what might have been a heavy lift. As the creature invasion intensifies, Cornish must shift our loyalties so that we wind up seeing the muggers in a more human light. We must begin rooting for them to lay waste to these hideous invaders, whose ire is provoked when the charismatic Moses (John Boyega) kills one of their number, a reptilian looking monster (part of advance guard?) that bears little resemblance to the hairy hordes that follow. The question: Who’s tougher, the relentless aliens or resourceful London teen-agers who live by the code of the streets? Not everyone appreciates the imminent danger, little things like having one’s head torn off. Take High-Hatz (Jumayn Hunter). High-Hatz sells marijuana and believes that he controls the block. One of his cohorts (Nick Frost of Shaun of the Dead and Hot Fuzz) operates out of a small apartment in the British equivalent of the projects, which is where all the movie’s characters live. Without giving anything away, let me say that High-Hatz overestimates his powers. For a first-timer, Cornish does pretty well with the action sequences, some of which take place within the choking confines of the anonymous hallways of apartment buildings, and cinematographer Thomas Townend makes the most of rain-slicked streets, the dark glow of night and the expected urban grit. Cornish also understands that sometimes the movie’s mixture of humor and horror is augmented by what’s not shown. When monsters and prey enter an elevator, for example, Cornish’s camera remains outside. Does the movie have a message? Perhaps Cornish wants to remind us that the kids in these neighborhoods are capable of more than some may think, that the police are disinclined to give such young men a break and that it’s possible for warring factions to unite when presented with a common threat. 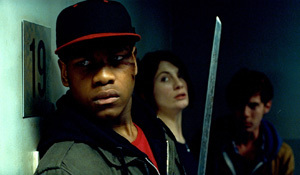 But don’t make too much of the movie’s thematic gestures: Attack the Block - well acted by a diverse young cast - isn’t out to teach us a lesson, but to play around with an idea that’s been hatched with imaginative vigor. And for once, the aliens don’t look like they’ve been copied form dozens of other sci-fi movies - at least not to my eyes. They have a kind of cheesy quality that’s perfect for what I assume was a modest budget and for a movie that’s not afraid to poke a little fun at its own genre. So watch for Attack the Block when it hits your town - as it is just now hitting mine. It arrives with force, energy and the ability to unite an audience in vocal appreciation of its B-movie pleasures.